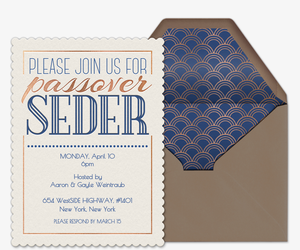 For a Passover celebration no guest will want to pass up, start by sending a digital invitation from Evite. Get friends and family together for Passover Seder. Choose from our diverse collection of free and Premium Passover invitations featuring traditional symbols of the Seder, from four cups of wine to mountains of matzah. Include additional details in your custom host message, like whether guests can bring guests or notes about a dress code. If you’re inviting any non-Jewish guests to their first Passover Seder, you may want to provide a brief note explaining the purpose of Passover, or “Pesach,” and its commemoration of the Israelites’ escape from slavery in Egypt. Once you have sent your free e-invitation, you can even ask guests to contribute kosher food and drinks using our “What to Bring” tool. Make it easy on yourself by sending out a free Evite invitation. 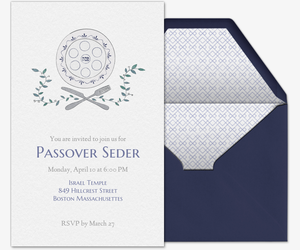 Whether you are hosting a formal Seder dinner for family or keeping it casual, Evite has a digital invitation fit for the occasion. For a traditional dinner observing Passover rites and rituals, choose our free design featuring all six symbolic foods on the Seder plate, from hard-boiled eggs to bitter herbs. Or go for our free design with step-by-step directions for making matzah ball soup. Starting the night off by reciting the four questions? Set the scene with our free “Why is this night different?” invitation. Love a little fun with puns? 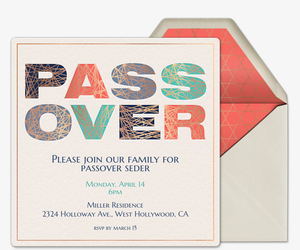 Go for our free “Don’t Pass Over Passover” invitation. You can also customize our upload-your-own invitation template with a family-favorite photo. For an extra special touch, send out a Premium Evite invitation -- Evite’s paid option that includes complementary envelopes with colorful liners, custom digital “stamps,” and the option to add extra photo or text cards. Our ad-free Premium invitations can be purchased for less than the cost of postage stamps. 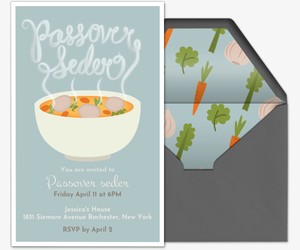 Choose from various Passover dinner invitations, from a modern “Eat, Drink, It’s Passover” chalk design to one featuring the symbolic four glasses of wine. Don’t forget you can also put a personal touch on your party by uploading a favorite photo onto our upload-your-own invitation template. Premium Evite invitations allow you to upload an entire design onto our design-your-own invitation templates. 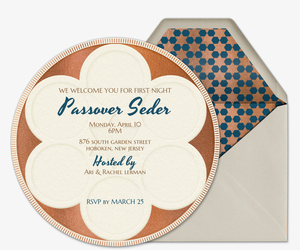 Head over to Evite Party Ideas at ideas.evite.com to get Passover tips for both hosts and guests. Check out kosher-friendly recipes for matzo ball soup, braised short rips, flourless chocolate cake, and more. First-timer? Check out our Dos and Don'ts of Passover Seder for Non-Jewish Newbies.